Nemo’s been found and his identity revealed, meet the Ocellaris clownfish! The Ocellaris clownfish is the most recognized little orange saltwater fish in the world. This personable little fish began its long journey to stardom many years ago. Because it is very hardy, it first became an all time favorite of aquarium keepers. Then with its eye-catching appearance, it became the marine fish icon for coffee table books, advertisers, and publishers. Finally, lo and behold, the movie industry picked up on this illustrious little fish. 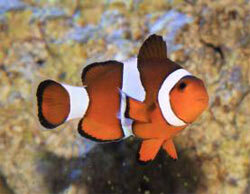 They dubbed it “Nemo”, and the Ocellaris clownfish became the star of the popular 2003 Pixar film “Finding Nemo”! The Ocellaris Clownfish Amphiprion ocellarisis not a stand alone in looks however. It’s very close in appearance to the Percula Clownfish Amphiprion percula. In fact they are so similar that the two are often confused, even by the experts. It takes a keen eye and a good memory to discern which is which, and the Ocellaris also became known as the “False” Percula Clownfish. Learn more about the habitat and care of this personable little celebrity, really known as the Ocellaris Clownfish, and learn how to tell the False Percula Clownfish apart from its look-alike cousin the True Pecula Clownfish!